It’s almost the spring, and that means that skate parks will soon be opening again. Soon skateboarders who have been locked indoors during the winter can take to the ramps again for their favorite pastime. I’ve always loved to board, but the sport seems more popular than ever. Now, my kids want to see what the game is about and want to have the best skateboards as well. Skateboarding is one of the most healthy, social exercises for anyone to take part in. Going out skateboarding with your kids can help deepen your relationship. It is also a great way to get a little exercise in as well. While there are dangers associated with half pipes and rails, if you and your children wear the proper safety gear, the threat from these is significantly reduced. Skateboarding provides a full body workout that can be increased by adding a few tricks and inclines. You and your kids will work your legs as you push off, your arms as you keep balance, and your core when you twist your body to steer. For a standard skateboarding session without a lot of tricks, your children will burn more than 150 calories an hour. The sport also will increase the body’s physical endurance because you’ll want to spend hours skateboarding. This is also advantageous because skating for hours on end also builds patience and an understanding that practice produces results. One of the most beneficial features of skateboard riding is its impact on balance. It isn’t easy to stay upright on a fast-moving skateboard, so in order to acclimate, your child will need to learn how to balance effectively. Once your child begins to learn new tricks and to grind, he or she will also have a high degree of coordination and precision as well. Safety – Skateboarding is an enjoyable sport, but like any sport that happens on concrete and hard surfaces, your children should practice safety. One of the biggest things that you should impart to your children when they buy a skateboard is that complicated tricks will only come with practice. A Skateboard Helmet – Any new skateboarder is going to fall quite a bit, so it’s essential that you or your children are protected from concussions. Skateboard Elbow Pads and Kneepads – With the inevitable falls, these will protect from scrapes and bruises on the elbows or knees. Padded Shorts – Skaters use padded shorts to protect themselves from abrasions and bruises when they wipe out. It’s imperative that you never skimp on safety gear. Your child might not want to wear these sometimes bulky items, but the protection that they provide is essential. Consider Your Child’s Skill Level – Since this isn’t necessarily your child’s first skating experience, it only won’t do to purchase a board that isn’t designed for more intermediate riders. On the same token, you don’t want to purchase an intermediate board for a beginner either. Looks play a part in many skateboard purchases, which is unfortunate because a good looking board might not be the best for a beginner. As a general rule, if your child is starting, a good board for a beginner won’t have a lot of extra features. It won’t have components for tricks or larger wheels for going faster. Once your child reaches an intermediate level of riding, then you can consider the more fancy, trick-friendly features. There are currently three main types of skateboards. For the most part, you’ll see a lot of the first two options on the market. Longboard – These are primarily designed for cruising, not tricks. These tend to offer more stability than other types of skateboards, which makes them perfect for getting from point A to point B. These are typically 35 inches long or greater. Shortboard – This is the most trick-friendly option. If your child is going to be grinding, doing ollies, or leaving the ground at all, then select one of these. Skateboarding using a shortboard is also called vert skateboarding. These are usually 33 inches long or less. Penny Board – This is just a plastic skateboard. Penny is also a brand name, but their types of the board have also become a type over the years. These have rounded edges and are very durable. This is very important. A skateboard’s wheels are what decide its cruising speed and acceleration. 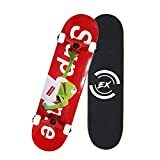 Also, its truck, which is the connector that connects the wheels and the board, is a major deciding factor on which wheels can be attached to the skateboard. Then it will be suitable for cruising, especially considering that larger wheels will accelerate faster. This board is great for tricks due to its durable plastic construction. Its overall size also makes it great for the skate park as well. Stability is an important factor for anyone who intends to use these in a trick-friendly setting, so it’s great that these have strong and light aluminum trucks. These also provide quicker turning when you need to change directions. 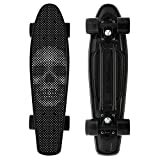 This penny board has four designs, each of which features a stylized skull, which would look great in the park. The wheels do a great job at gripping the pavement due to its high-speed bearings. Each design is unique and eye-catching. It’s designed for beginners or more advanced riders. It can be too small for some riders. The skulls aren’t for everyone. As a penny board, you’ll only really be able to do tricks, and this isn’t big enough or fast enough for cruising. Rimable’s 22-inch board is a plastic board that is considered a mini-cruiser. Mini cruisers are a variation of the longboard that can be much shorter than traditional longboards. All the same, this board is perfect for smooth riding to wherever your kids would like to go. The wheels are larger on this board, which makes the Rimable Complete a great option for speed and acceleration. This is definitely a board that your kid can use to go to school or a friend’s house with ease. Its trucks are made of aluminum, so you can expect that between the plastic body and its trucks, this will be a relatively lightweight and strong board. For your child’s sense of style, this board also comes in 27 unique colors. It can carry 198-pound individuals. It only weighs about four pounds. It’s a lovely board with its diamond design. It has a good grip. For some, it may be too cheap-looking. The paint can chip fairly easily. It’s not great for tricks. One of the coolest features of the Golden Dragon is its unique dragon-inspired design. The board comes in a mixture of reds, yellows, and blacks and is very eye-catching. You don’t have to attach the tape to this board manually, and I find it a nice design note to also include a dragon design on the grips. But the manufacturers designed it with tricks in mind. Check Here for More Details — manufacturer site for more features. This is a good board for beginners or even advanced boarders. It turns well and has a great balance. The wheels can be a little too hard. It’s not for larger riders; it can start to bend if you are much more massive than 180 pounds. The next skateboard in this list is from Team Positiv. It’s an excellent board for young people and is designed with tricks and the skate park in mind. You can also select the board material that you’ll get with this skateboard. Birch or maple are the material selections and both work fairly well for skaters. POSITIV? Skateboards Andy Mac "Digital Series" Assembly 8"
Design-wise, the board itself is fairly long; it measures 32 inches in length, and the trucks and wheels are relatively small, which is a major indicator that this board is designed for tricks. Aesthetically, the Positiv logo is featured along the base of the deck, between the trucks, which adds a futuristic vibe to the board. Check more details. 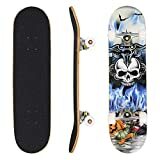 This is an excellent board for a young beginner or an advanced skateboarder. It comes complete with everything needed for skateboarding. With its small wheels, it’s great on pavement. This isn’t a board that has a lot of artsy bells and whistles. The wheels aren’t necessarily balanced. The only full-sized longboard in this guide is a well-designed board from Sector 9. The Fractal Complete has an excellent cruise-friendly. You’ll notice by the wheel cutouts and the 36-inch length that the Fractal Complete is purely designed for traveling. The wheels are larger, which is great for speed, but it doesn’t have a kicktail for tricks. When it comes to its ride, the Fractal Complete has a smooth performance and is fairly fast as well. While the wheel color can vary. 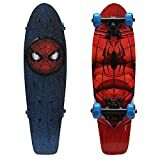 I found that this longboard has a design that is nice and understated, which is excellent for commuting. computing over to manufacture site and see more details. This thing offers a very smooth ride. Its deck is constructed of cold pressed maple, which is exceptionally strong and also has some flex. The wheels can come in a wide variety of colors. While the top is understated, the bottom can be a bit busy for some riders. A good skateboard is an excellent investment in either your own or your children’s health. Finding the right one isn’t easy, so take a look at what I’ve selected, check out our value section, and make an informed decision. Skateboarding is a fun and entertaining exercise, but skateboarding to work or skateboarding off-road can be a hassle. First, skateboarding to might mean that you are sweaty when you get to the office and skateboarding on harder terrain can also be very tough. Fortunately, this is where electric skateboards come in. I’ve been an electric skateboarder for the last five years, and I love going to and from work on my board. First, it lets me enjoy the neighborhoods I board through, and secondly, it helps me avoid the hassle and cost of mass transit on weekends. I also have an off-road board that I use to go on adventures in the outdoors, this is one of the most fun uses of an electric board, and I recommend it to anyone. The best electric skateboard for you is going to depend a lot on your use, so let’s take a look at some considerations. 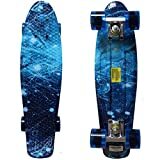 Type of Use and Skateboard-How are you planning to use your new electric skateboard? There are different types of powered skateboards for different uses. Kids’ models – These are usually not made for range and off-road capability. In fact, many kids’ electric skateboards are cheap toys that a young child can entertain themselves with. 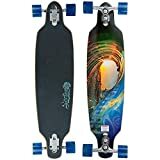 While this isn’t always the case with teenager models, it may be best to buy a different style of board if your teenager is interested in learning to ride an electric skateboard. Cruiser Electric Models – These are excellent for commuters who are looking to avoid mass transit. These powered units are built for range and speed and are best used on city or town streets. These are also called commute boards. Off-Road Models – Off-road models key focus is durability and power. This means that you will more easily get over uneven ground, gravel, and through the soil. You’ll get a much more overall boost in an off-roader electric skateboard than you’d need for a cruiser. 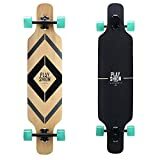 Price – One thing that you should know about electric skateboards is that they are typically more expensive than a standard skateboard. Also, the higher the price you pay, the more range a board will have. That being said, make sure that when you buy one that you are going to use it frequently. Otherwise, it can be a waste of money. In my experience, cheap electric skateboards are just not up to snuff when it comes to overall quality and range. This brings us to my next consideration. You should have a board that has an excellent overall range so that you can commute the entire way to work on it. This is typically tied into battery power, so if you want maximum range, you should purchase an electric skateboard with more battery capacity. This will, of course, cost you quite a bit more, so try to shoot for a balance when you can. Weight – Larger battery capacity can significantly affect the weight of your board. While you might not notice this much when you are riding it from place to place, if you happen to run out of power during your trips, you’ll have to carry it. For this reason, try and find a board that is both lightweight and also has a reasonable range. It’s not unheard of for a board to weigh 50 pounds. An excellent example of this weight class is the Flik Big Daddy. The tradeoff on these heavy boards is that they have superior power and excellent grip. On the other hand, there are also boards that weigh as little as seven pounds that are also great on city streets. Speed – This is a significant consideration for commuters and vehicles like this are becoming more of a factor. You don’t want an electric skateboard if it barely goes fast enough to justify not using mass transit. So you can use that speed as your starting point. Some boards can even go as fast as 28 miles per hour, which will make most commutes reasonably easy. Charging Time – Many electric boards can go about 15 miles on a single charge, which is very advantageous. Despite this, if you want to go 15 miles a day, then you should be able to charge up your skateboard between trips. With this in mind, your board’s charging time becomes a significant consideration. Fortunately, most brands of electric skateboards will charge in less than three hours, which gives you the capability to load your board while you are at work or in class. Evolve also has a great list of considerations that you can use as well. A longboard, which skateboarders use to cruise on, is the perfect type of skateboard for an electric motor. 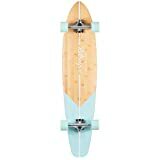 This is because these boards are designed for the long haul, and the X-Board is an ideal example of a good, commuter-style longboard. One of its best features, in my opinion, is its built-in handle. From time to time, you’ll have to carry your electric skateboard; whether it’s just up the stairs to your desk or because you ran out of juice, moving one can be a chore. Fortunately, the handle on this makes it very easy to transport this product. On top of that, the board only weighs 11 pounds. This electric skateboard only takes two hours for a full charge. It has a range of nine miles. It can carry a rider up to 220 pounds. I wish this had a faster speed; it only can reach about 15.5 miles per hour. This isn’t the best board for a newbie. Our second longboard-style electric skateboard is the Boosted Dual+. 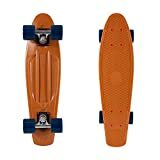 This skateboard has a very sleek design that has well-placed grips and an orange and black aesthetic. It’s also very fast. Insofar as composition, this longboard is made of some quality materials. The deck is completely comprised of 100 percent bamboo. Bamboo is an ecologically sound material that is stronger than Canadian maple, which has become the industry standard. When it comes to performance, this longboard can be used by an app. I found this a nice feature; you can adjust your speed on your smartphone as you cruise. To improve overall functionality, the board also has three microprocessors and a suite of sensors for a robust experience. It only weighs 13.5 pounds. Bamboo is an excellent skateboard material. The Dual+ has 2,000 watts of power for acceleration up hills. It has a top speed of 22 miles per hour. You can only go for about seven miles on a charge. The aluminum casing on the rear truck is easy to hit on bumps. Sometimes, you want to take your electric skateboard on adventures. The Mototec Dirtboard is the perfect travel companion for those times when you want to go off-road. The trucks on this board are specially designed for the rough; they have shocks and a gear train that’s very effective and powerful. When it comes to design, this board has a fairly nondescript deck. It is comprised of maple and is very sturdy for relatively larger riders. This electric board is built very durably so that you can enjoy it over gravel or even in wetter environments (it’s water resistant. Check here more details. With all-terrain wheels, you’ll be able to go just about wherever you want. It can run for ten miles reasonably smoothly. It has a maximum speed of 22 mph. It only has a 1600 watt motor. The remote is a bit kiddy. This is a cumbersome board at 71 pounds, so don’t get caught out there with low power. Our fourth entry has a great design that lets it be used in most off-road situations. I think this product would work well in a commuting environment because of its 23 mph speed and its 15-mile range. Aside from any commute performance, the GT Powerboard has a few great features for off-road. First, it has excellent breaks that will even control your speed when going downhill. Secondly, its overall power will allow you to go through most challenging terrain situations. Couple this with the larger, treaded Kenda pneumatic tires and you should be fine in most environments. This product has a .25 “dropped” aluminum deck that provides a lower center of gravity, which is useful for getting over obstacles. It has an oversized drive belt that transmits power very efficiently. For a powerboard, this product has a very fast, 23 mph speed. This board has a 300-pound carrying capacity. It’s a full 72 pounds, so be sure to keep it charged. The remote control is wired, which can be a hassle. Sometimes, with a commuter board, you don’t need speed, you need range. The Yuneec E-G02 is a tremendous electric longboard with an 18-mile range that means you might not even have to charge this product every day. While it can be considered slow compared to other boards, the minimalist design of this board makes it excellent for getting to where you need to go. Also, when comparing the Yuneec E-G02 to other electric skateboards, you’ll be surprised at how much more inexpensive this product is. Check the manufacture website. The 18-mile range on this board is excellent. It has a great, simplistic design that’s nice for commuting. It does a good job going up hills. You can connect the board to an iPhone app to track battery percent. This board charges somewhat slowly. The remote can have connection issues. Electric skateboards can add a lot of convenience to your life. They have a smaller ecological footprint than mass transit or driving, are much less of a strain than riding a bike, and are fun to ride around on. 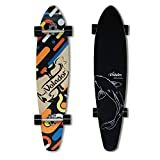 I hope my guide helped you find your electric skateboard if not, use the value section to help you find a good product. When it comes to skateboards, the brand does indeed matter. If you go for a no-name board, there’s a chance that the manufacturer used shoddy materials. When you place your faith in shoddy materials, there’s a good chance that they’ll let you down and break. With this in mind, I almost always buy my boards from a list of manufacturers that’s maybe ten companies long. The brands that I purchase from tend to have things like a better overall construction, better materials used, and better shaping of the deck. Which of these has them all? Well, for the most part, the brands that I will feature will employ some great overall attributes that will give a better skateboarding performance. The Top Materials – The better brands tend to employ more premium materials in their skateboards. Carbon Fiber – Carbon fiber boards and decks are some of the best currently on the market. I’ve seen this material really start to take off in the last decade or so and soon it may become even more popular than the standard wood boards. Carbon fiber decks are much tougher than wood decks, and they won’t get razor tail as easy. For those that don’t know, even the best wooden boards can get sharp edges from tricks, which cause razor tail. Carbon fiber tends to be a bit heavier than wood, and it can also be stiffer. Bamboo – Bamboo is one of the most flexible, lightweight woods on the planet. It shouldn’t be too surprising that some skating brands build full decks out of this material. Bamboo is a durable material as well; in fact, it’s considered to be an even stronger wood than Canadian maple. 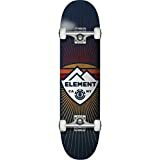 When I had the chance to try out a maple board by Element, I was amazed at how quickly it was able to flex during tricks. Another great advantage? Bamboo is very eco-friendly. Canadian Maple – This is the industry standard for skateboards – at least the standard of the major brands. It’s essential that you don’t select a board that says “maple.” I’d say that nine times out of ten, these boards are of much lower quality and will break within a few months. Just about all of the brands have great Canadian maple boards, so if you want a high performing deck/skateboard, feel free to chose one from their catalog. While the Element of today has a plethora of products and apparel, its real roots lie in skateboarding. The company’s stated goal is to “bring progress to skateboarding. As a result, you can always assume that an Element skateboard will be of a high degree of quality in both materials and design. As one of the most mainstream manufacturers, this is also a ubiquitous brand name to find just about anywhere. The company began its history in 1992 and had become one of the top skateboard manufacturers in the world. 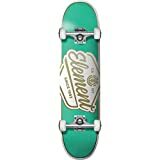 Element’s products always feature unique art and an aspect of all of the elements, which you’ll find in the product that we’ve reviewed. This particular board has a lot of great features, but you’ll have to assemble it when you receive it. 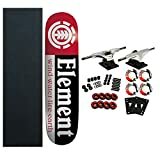 In use, this board is great for beginning riders and has some nice construction that’s perfect for someone who wants to learn. It’s made of seven plies of hard rock maple that make this board perfect for the occasional accidents that can happen during the early stages of skateboard learning. check more details here. 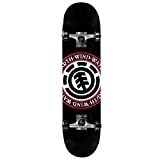 Element Skateboards Swash Complete Skateboard - 7.5" x 31.5"
Element Skateboards Guard Complete Skateboard - 7.75" x 32"
Element Skateboards Seal Black Complete Skateboard - 8" x 32"
This board has a nice design that features Element’s logo on the base. It has a nice, solid design. The wheels can be a little too soft. Founded in 1993, Girl was created by Mike Carroll and Rick Howard. These two pro skaters wanted to ensure that other pros had a future in skating long after they’ve grown old. As a result of their efforts, Girl has become one of the biggest names in skateboarding. In fact, the company has become a distribution house for several brands, including Chocolate Skateboards, Royal Skateboard Trucks, Ruby Republic, and Fourstar Clothing. When it comes to Girl Skateboards, the company has a wide array of options available. 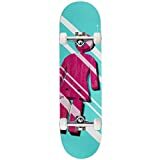 While you’ll mostly find decks on their site, the company does have trucks and wheel selections as well. 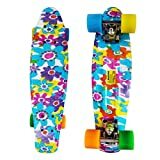 If you’re looking for colorful, bright options, Girl seems to love this type of board. Mike Carroll, the designer of this board, is one of the founders of Girls Skateboards. Like the Element board, this board will require some assembly, but its design is perfect for those who have a little more experience. As a trick-oriented board, you’ll find that the trucks are well-placed and the board itself has a good balance to it. check more details about the brand. Girl Shutter OG Skateboard Complete - Mike Carroll - 8.375"
Girl Skateboards Mike Mo Capaldi Oil Slick Skateboard Deck - 8.12" x 31.625"
Has a bright lively “Hella Kitty” artwork along the base of the board. The grip tape is excellent on this particular skateboard. The wheels are made of a suitable polyurethane mix, but they are a bit small for some beginners. Zero skateboards were created in 1996 and serve as the skateboarding brand that is the most underdog-friendly. The rebel spirit has always been one of the features of Zero that I liked the most. And in its 20-plus years, the company has become a significant force in skateboarding. Zero skateboards have one unique, defining feature: they all feature skulls and skeletons. The brand started as a skating apparel company but soon transitioned into a manufacturer of actual skateboards. Check more details here. Like most skateboards in the Zero line, the Brockman Pirate features a stylized skull on the board. This is a very high-quality design for a very high-quality board. Zero constructed the Brockman Pirate out of durable Canadian Maple so that the board would be strong and semi-flexible. Rather than use aluminum, the trucks on this skateboard are made of magnesium, which is a very strong metal. 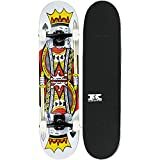 Zero Skateboards Bold Black/White Mini Complete Skateboard - 7.25" x 29"
Zero Skateboards Single Skull Black / White Complete Skateboard - 8" x 32"
The Black Diamond grip tape is very useful for tricks. The board uses seven-ply Canadian maple. The concave deck on this skateboard might be too mild for some more advanced riders. You can recognize an enjoi board by its panda logo. 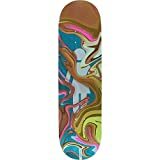 The company primarily produces decks, though you can also purchase clothing and accessories from them as well. The company came into existence in 2000, and it was founded by a team of three professional skaters. 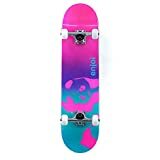 enjoi skateboards are designed to embrace popular culture and the skater lifestyle; as a result, each board is colorful, can feature pop culture icons, and will often feature the company’s iconic panda. Also, if you’re looking for a more risqué board, there are several options available from the brand. It’s easy to identify enjoi skateboards due to the stylistic panda that is featured on all of their products. The Whitey Panda board is a board with a tremendous concave build and plenty of pop for tricks. Also, this seven-ply maple board has plenty of durability for beginners and intermediate riders. check out the brands. 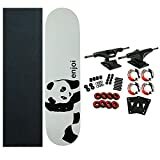 ENJOI Skateboards WHITEY PANDA Complete SKATEBOARD New! The design is simple, which many skaters love these days. Doing tricks on this board is easy. The white paint gets fairly easily damaged over time. 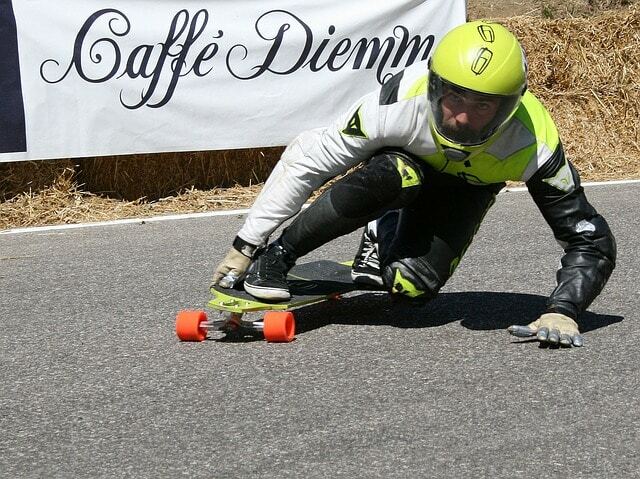 SCSK8 is an excellent option for those who don’t want to spend a lot of cash on their board. While the company itself is relatively new, their boards have already gained a following. The company also uses good materials in the construction of their boards. Frankly put, the price of these boards as well as their relative simplicity makes them perfect for beginners. This cruiser board has the ability to both cruise down the pavement and execute tricks. At 31 inches in length and a width of eight inches, you’ll find that this board is very versatile and steady. Its seven-ply maple build is also solid; in fact, this board can support riders of up to 225 pounds in weight. There are 15 different design options for this board that ranges from clear wood tones to a version that features a zombie, which is great for those looking for personalization. This is an excellent board for beginners. It has a good level of turning ability. It can work well in the park or just for a quick commute. The wheels and the trucks aren’t of the highest quality. 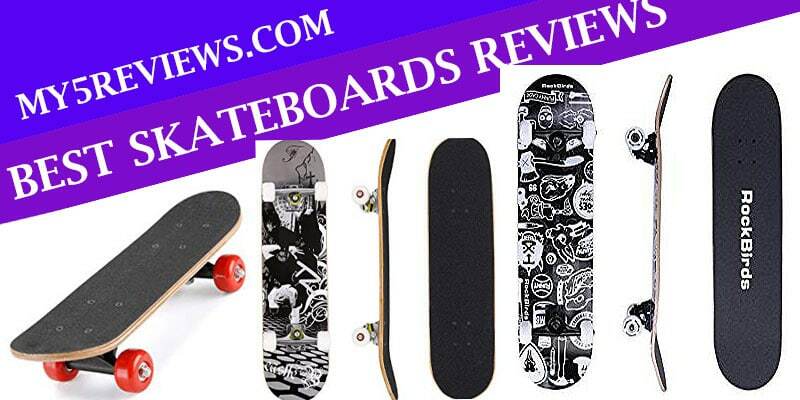 The best skateboard brands will provide a perfect ride for any level of skater. All you have to do is find the model that best suits your style. Each of the brands that I’ve covered has a ton of choices for you, so don’t feel limited to the example boards that I picked. In any case, I hope you find the board that you’re looking for. Recommended for ages 5-10 years, supports weight up to 100 lbs. Meketec Unique Technology - The strong 3.25 inch trucks with different color with others skateboarder，let you skateboarding slide more distinctive. 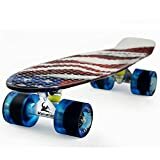 Performance - High speed abec 7 meketec Bearings; 60mm Urethane wheels; 22.5 inch long x 6 inch wide deck, max load weight 200 lb. High Value - Meketec Unusual skateboard appearance outperforms many of the leading brands and high cost performance price. Advantage - Take this board on the park, school and road with ease, It's the best holiday gift for Kids and Adults. Safety Guarantee - With CE certification, this well-built skateboard is safe to ride and suitable for any level of riders, no matter whether you're a beginner or experienced rider.